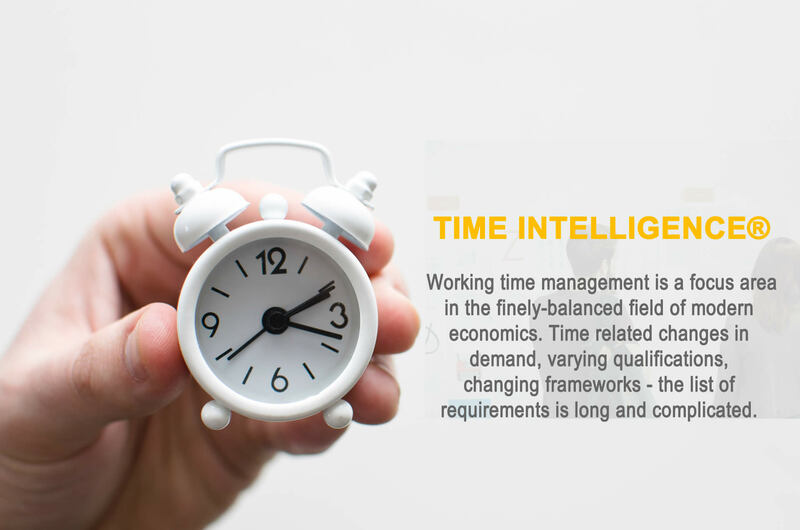 Working time management is a focus area in the finely-balanced field of modern economics. Time related changes in demand, varying qualifications, changing frameworks – the list of requirements is long and complicated. One of the main tasks here is achieving optimal personnel cover. In practice, this is a continuous and cyclical process, a process of ongoing optimisation. A suitable software tool for ensuring that this cycle remains productive, and that solutions for the task at hand are simpler and more effective, is timeintelligence® solutions from ximes. With this newly developed tool, you can answer your most complex questions, and create a new basis for the constantly repeating process of working time management in your business – to the advantage of all parties involved. Professional working time management is aimed at the optimal matching of needs and actual staff. This can only be successful with the appropriate information. Actual data in many organizations is an untroubled treasure. How much is the current plan requirement and actual planning? Are there any patterns of deviation? How good were the forecasts? Can patterns and influencing factors be identified? Are the default times? At the same time, [TIS] planners are helping to make it better by allowing forecasting and personnel requirements to be adopted by [TIS]. The great strength of the software against standard programs is that it adapts to your requirements. They may be e.g. Refine your forecasting process by checking if another would have brought better results. Consistently applied avoid overloading and under-utilization and reduce risks. Users can simply import data into data nodes and refer to such raw data nodes and computation results (which themselves are data nodes again) and apply computational operations. The special time-related know-how is expressed in flexible import and calculation operators and analysis functions. Thus, e.g. the classifications of time and activity types (e.g., holidays, bridging days, holiday days, special events, …). Compared to Microsoft® Excel, the application of the computational operations is much easier since they always affect a whole data node. Computing operations can thus be applied transparently. Graphs and reports that are aligned to the display of time-related data are also available automatically. With [TIS], company-specific analysis and forecasting tools can be easily assembled using the internet. What can and should be assembled depends on company-specific circumstances. In a retail company the first question that came up was whether sales increased or decreased in the course of a month and whether the sales curve of a month had an influence on turnover. ximes thus developed a visualisation, which allowed a comparison of the turnover by showing the developments in each month over time. Another interesting question: What is the correlation between staffing levels and real turnover? This interplay of staffing level and turnover, staffing level and performance, staffing level and overtime is interesting for a variety of different cases. Are there any correlations – and if yes, which ones? The concrete design of an analyis is different for each company but it must take the specific circumstances into account and must produce a good overview. One possible visualisation could present the sales in different weeks at specific times of day and on each day of the week in the form of a map. An extremely interesting perspective which makes peaks perfectly visible. In cooperation with the company interflex, ximes developed a comprehensive, highly adaptable forecasting and campaignplanning tool for call centres which helps with a variety of definitions and aspects in the planning phase. Similar solutions can be implemented for a variety of sectors, e.g. the retail business. As explained above, the optimisation potentials or target workforce requirements must be calculated specifically for each company and project. A task for which [TIS] – an extremely flexible and powerful analysis and forecasting tool – fits like a glove.